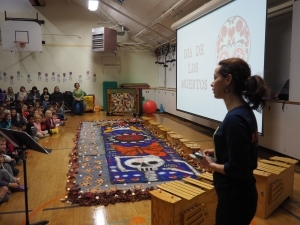 Spanish at Meridian introduces students to the language in a native immersion classroom environment. Our Spanish program allows our students to learn Spanish in the most natural form possible. Vocabulary and grammar are practiced through storybooks, songs, creative visual and auditive aids, crafts and cognitive games and printable activities. Students in all grades attend one, 60-minute Spanish class per week. Children who have learned a second language often perform better than monolingual students at school. Children who have learned a second language tend to learn to read and write faster than monolinguals. Learning Spanish will facilitate the learning of other Romance languages. Sound reception is more accurate for learning a third language. Children who have learned a second language develop stronger solving-problem skills and become more creative. More than 500 million people worldwide speak Spanish. The United States is the second largest Spanish-speaking country in the world. To learn and improve listening and communicative skills in Spanish. To help students attain higher levels of thinking and problem-solving. To empower students to express their ideas and need in Spanish. To prepare students to become contributing members of a diverse and global society.